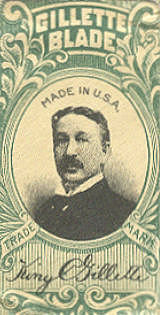 King Camp Gillette (1855-1932) and William Emery Nickerson invented the world's first disposable razor blade in 1901. Until that time, portable shaving devices consisted of a wedge shaped heavy metal (forged) blade on top of a handle. When dull, the wedge was stropped by hand until it could no longer keep a sharp edge. It is said traveling salesmen referred to such shaving devices as cut-throat razors, as they were quite dangerous to use on a train. Gillette conceived the idea of a disposable blade in 1895. He was told by leading metallurgists of the day that it was economically unfeasible to mass produce (stamp) such thin pieces of sharpened metal. He soon met W.E. Nickerson, and after six years they were able to invent the equipment necessary to produce the first disposable blade. They patented the invention in 1901 and started the American Safety Razor Company (re-named the Gillette Safety Razor Company in 1904). The safety razor was a huge success. By 1910, King Gillette was a millionaire. His portrait was printed on every package of blades, which gained him great celebrity. In personal life he believed in utopian concepts, and wrote a number of books promoting common social advancement. Sadly, Gillette lost most of his fortune in the stock market crash of 1929. The Gillette Company thrived independently for 101 years, and was purchased by brand-savvy Proctor & Gamble Company in 2005. King C. Gillette was a also marketing pioneer. He invented the Razors and Blades Business Model of selling razors at little or no profit, and making more money by selling great quantities of high quality disposable blades for those razors (today known as the Freebie Marketing Model). The Gillette Company has also been a text book product life-cycle innovator, with new features or products introduced every few years. This author has used the Trac II, Atra, Sensor, and Mach III (tm's) products over the past 30 years, and looks forward to future generations of shaving technology. In 1926, Gillette built a large home on 588 acres of land in Calabasas, California. The mansion was later owned by Clarence Brown, a famous MGM film director, and then by comedian Bob Hope and others. The property is now a state park called King Gillette Ranch, and was thankfully preserved.